"I paddled over the shoulder of a set wave and an instant later a guy popped up from his duck dive a moment behind me. I knew him well, we had surfed together often. But we were 12,000 miles from home, and neither of us knew the other would be there. I said, "Hey." And he said, "What's up?" Like there was nothing out of the ordinary, like it was no surprise that either of us should pack our bags, fly for two days, and boat for another to surf this place on the other side of the planet and not expect to run into one another. Surfing is like that. The commitment is like that." 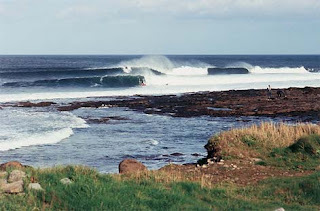 The-Secret-Spot-That-Everybody-Knows-About, aka Everybodys, somewhere on the west coast of Ireland. Don't ask the guy bottom turning on the red board, Barry Britton. He's probably surfed it alone for 30 years.